Kintoki tells the story about a normal day of the 19-year-old boy Toki who is part of the almost extinct warrior tribe, the Aurumoculi. Kintoki: Kinmezoku no Toki is sixth in a series of one-shot featured as a part of Weekly Shounen Jump's "Top of the Super Legend" project. Before i start let me just say that this is my first review, that is why i'm trying it on a one shot. I like this one shot a lot. In this one chapter it showed like-able characters and a good plot. The art style was very good resembling that of Dragon Ball Z, because it was made by Akira Toriyama. The Story draws you in making you want Akira to make this a full blown series. If you read this one shot, and your a Dragon Ball Z fan, i'm sure you would like it. For an Akira Toriyama stand-alone story you'd either have to be an absolute fan and purely love his words, or a fan who can recognize when he's missing something. A tribe still exists in this outcast planet known as the Aurumoculi. The Aurumoculi are some of the strongest beings on the face of the world and can be spotted for their golden textured eyes. Our main lead "Toki" happens to be a survivor of his tribe and is on the look out for a women to help continue his bloodline. A story so generic, it's best delivered in 34 pages and less. A simple story, no 'Kamehameha''s, no evil aliens taking over the world, nothing we've seen from Toriyama before, including a solid story structure. 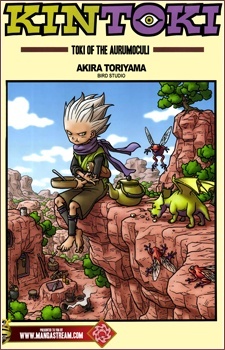 Toriyama sets up a rather small premise contained in a rather vast world, as he always likes to illustrate in his series, this is something we can recognize from Dr. Slump or even SandLand. A story with the potential to end the same way Dragonball did. Like most other Toriyama works, character development is left high and dry and is only slightly touched up during the progression of a series. A One-shot with only 30 or so pages is something Toriyama knew he could never manage. When it comes to characters, I'm sad to say, Toriyama is a little on the slow side. The artistic features found in Kintoki is no different than they are in any other Toriyama series. Immediately, once looking at the art, we can distinguish leading characters from generic characters that hold no positive value for the story. This is a great technique by Toriyama. Even while defining lead characters early, Toriyama doesn't forget to include unique features in supporting characters as well. Making the art well-rounded and balanced. Brilliantly paced, this story has all the time in the world in just 34 pages, nothing to rush and nothing to meet its end. As expected from Akira Toriyama, this one-shot paints a picture of an interesting world with well-written characters, despite the length of the story. It's a simple, short story that covers a day in the life of boy who's the last of his kind. Although he's alone in that regard, he manages to find himself a person to care about. It's warm story with trademark Toriyama humor and action that leaves you with a good feeling.